You know that one holdout shop on the other side of town? It's a small place, run by one guy. He's really put his heart and soul into it over the past few decades. The shop's seen better days, but that's not due to a lack of willingness on the owner's part. It's just that business has slowed quite a bit these past few years with big box stores and the ability to buy anything online. He just doesn't have the income to do all the upkeep he wants to. Oh, the place is rarely empty. There's always at least a couple regulars who hang out there a lot, but they only just buy enough to keep the place from going into the red. Any profits come from the occasional customer from out of town who stumbles on the place accidentally. And every day, when even the regulars aren't milling about, the owner wonders why he bothers and debates whether or not he should close the place up for good. 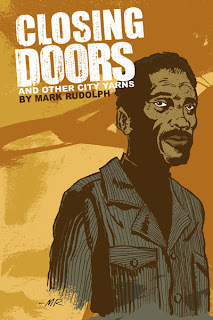 That's the first story in Mark Rudolph's Closing Doors and Other City Yarns. It's a really powerful tale in large part because, even though it's specifically about Elvin Cherry and his record shop, it's not at all difficult to see any number of other stores facing the same issues. The story isn't meant as an analogy, I don't think, and that's part of what it makes it so powerful; it's a very specific story with very specific emotions about a very specific situation. It just happens to be readily transferable to so many others that we've seen over the years. The comic shop, the antique toy store, the bike shop, the diner... You've been in these places, some recently, some years ago, and many of them have gone away. It's easy to step in to Elvin's record shop, even if you were never even much of a music fan. The book also houses two other stories: "Through the Cracks" and "Say It With Slugs." One is about a retired musician who is reporting a robbery to a police officer, and the other is a cub news reporter who stumbles onto a corruption scandal that's trying to be kept under wraps. Both of these stories are very good, but don't contain quite the emotional raw power of "Closing Doors." Definitely not to discredit Rudolph's ability, but he sets his own standard pretty high with "Closing Doors." The art and storytelling are top notch throughout, and it's primarily the deep emotional content of the first story that makes it stand out. The one art portion I'll criticize is a change in tonal techniques part-way through. The earlier portions are done with what looks like an ink wash. Mid-story it switches to more consistent and harder-edged tones; I'm guessing this is from computer shading. While the ink wash doesn't reproduce particularly well here, the texture it provides is very warm and provides some depth to the environment. The computer shading, while not bad, doesn't add as much richness to the story, particularly the buildings and backgrounds. It would hardly be worth mentioning, except seeing how much the ink wash adds in the same book makes me wish it had all been done in the same manner. 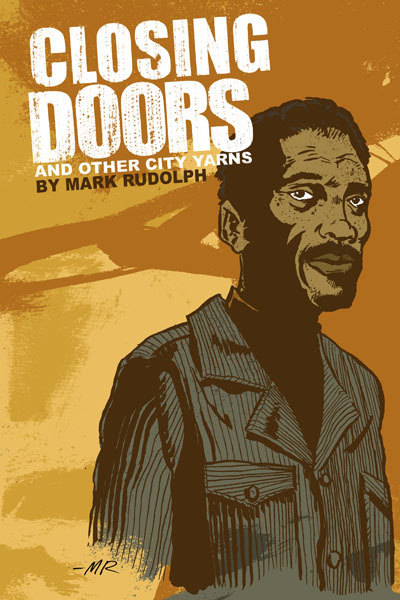 "Closing Doors" and "Say It With Slugs" can be read for free on Rudolph's site, or the book can be purchased for $9.99 via Indy Planet. Nice call. That was very good reading. Very melancholy reading, but then I'm hardly one to complain.